It's a conglomeration of past being made in present. Both Hyosung and Garware have had a past of textile industry and other subsidiaries, and both have decided to plunge into the two wheeled market at some point of time, in lust of the ever so enchanting mermaid we know as Motorcycles. Say Hello to Garware Hyosung. 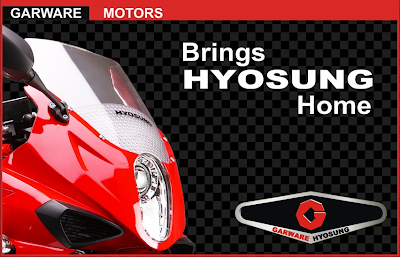 A quick look at the About Us section of the Garware Motors website, tells you a quick history of Hyosung's S&T's history, which actually is a direct pick from Wikipedia. Hyosung had a small stint India in the past which created on hell of a bang, when some limited numbers of Comets (GT250R) arrived and sold like real hot cakes. But after that it, there was a big lull from the Korean player and it was about time that it came back with an even bigger bang. 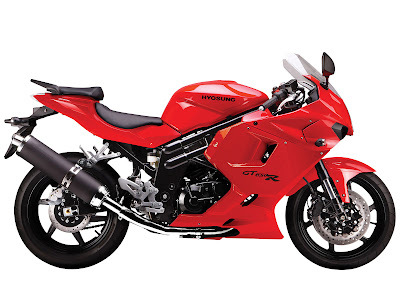 Garware Motors and Hyosung S&T are bringing Hyosung GT650R and ST7 in India. In this post I would cover GT650R, and ST7 would be covered in the next post so that together we can see each bike in greater detail. Introduced in the year, 2004, the GT650 has quite a few variants - GT 650 Comet, GT 650 FI Comet, GT 650R, GT 650R FI, GT 650S, GT 650S FI, GT 650X. 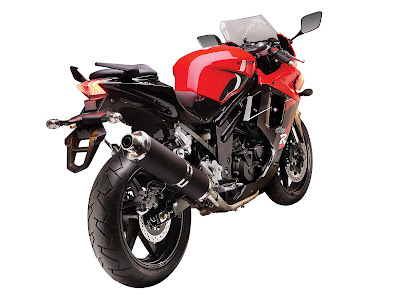 The model in which should be most interested in, in terms of legally available in India, is the GT 650R FI, because that's what Garware is bring to Indian shores. Performance wise, internationally, and in the country too (BikeIndia's review) testers have found the Hyosung GT650R as quite a performer. Specially when we are talking about the mid range. With pots aligned at 90 and cranking out 79 bhp, the GT 650R provides ample excitement to keep your senses engaged and your speed apatite busy. 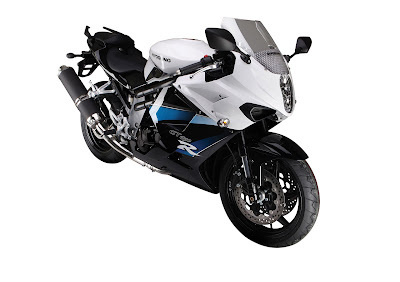 The older generation Suzuki SV650 inspired engine would provide ample muscular performance for any Indian riding condition you can think of, because seldom you get a chance to top a bike over here. People might complain about the weight of the bike, and it's bit higher saddle height, but that's actually a blessing in disguise when you put things to local conditions, where bumps are inevitable and scrapping the belly of any low height bikes is grudge to live with. From my point of view, on this bike, it would be a matter of getting used to. The twin spar trellis type frame gives the bike a rigid and stable feeling but at the cost of the weight. 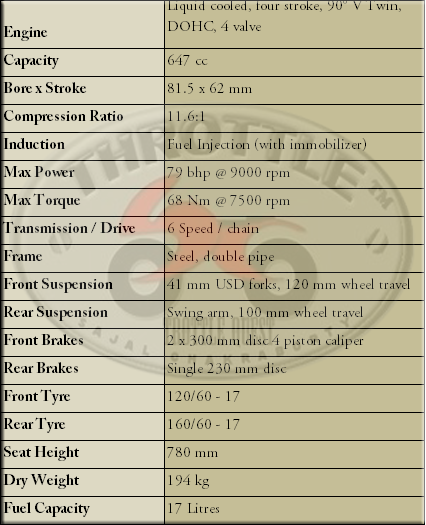 The spec sheet of the GT 650R says that the front USD forks are adjustable, but actually adjusting the settings don't have much introduction of play in the damping feeling. The rudimentary Mono-Shock rear suspension works on a stiffer factory settings which works well. The factory fitted Battlax BT56 rubber do a decent job when warm and inspires confidence in leaning the bike either ways. Talking about leaning, even though the bike's weight and saddle height might seem a bit off when you bring leaning in picture, but the GT 650R handles that very effectively once you start getting the hang of it. The vertically stacked twin projector head lamps are very effective and look coming straight from some of the premium European players. Everything on the bike seems fine until you start going towards the top end. Even though the bike has the capacity to rev past the 10,000 rpm mark, but as you do so, the plushness, the bike generates at mid range starts to fade out and you feel the engine stressed, which is very wayward from it's SV650 genome. It's one thing you would expect last from a bike of this genre. Another thing which comes forward as one of the concerns of this bike is the gear box. Even though definitive, but it's a bit notchy. The smoothness of the gear box starts to fade further as you climb the rev range, which couple of the shuddering engine response might prove to be real mood spoiler. Also, the brakes seem a bit spongy on the factory settings and do not inspire confidence. Even though the bike sports twin 300 mm discs up front, the braking doesn't look up to standard. Last but not the list, the fit and finish of the bike. It's one point Hyosung bikes have been criticized world over for quite some time now. Even when MCN did a comparo of the Kawasaki Ninja 250R and the Hyosung GT 250R, they found a comparatively new bike rusting at places, even though as a package they found Hyosung GT 250R almost at par with the Ninja 250R. The fit and finish of the GT 650R is good but not up to the standards set by it's competitors, the Suzuki SV650 and the Kawasaki Ninja 650. The Dials too, look dated and quality of the material used seems cheap. Overall the Hyosung GT 650R Fi is a great performer and there should be no qualms about that, because as I said earlier, that in Indian conditions we seldom get a chance to top out a bike. But the icing on the cake is even better. It was stated at the launch of the Garware Hyosung conglomeration that the GT 650R Fi would be priced some where between 4.5-5 lacs and that price, this should be a great deal. But what needs to be watched out here is that Garware does not have any road presence in India as of yet. Meaning, no sales outlets, no service chains. Before we get to see this bike, Garware would need to have the infrastructure setup. As per the press release of Garware, ten dealership would be setup across India and the company is planing to set two thousand units in the first year. The expected price is very tempting.. no? A few days back one of my friends checked out both the ST7 and GT650 in Pune.. he even manages to get a test ride. He told me that he wasn't very impressed with the GT650's, its refinement and quality was still a rung lower than the Japanese. But surprisingly he was quite impressed with the ST7. Your friend is absolutely right about his observations. The class to which GT650R belongs is so aggressive that Hyosung really has to pull up it's socks to bring the bike into competition. The build quality of Hyosung has always been criticized and that's why Hyosung loose market share compared to it's Japanese counterparts. The ST7 has no issues performance wise when you are into the rev range, but it also suffers from the same set of issues of build quality as the GT650R. You don't notice those much on the ST7 because on the class of bikes the ST7 belongs you are supposed to be relax and enjoy, but on the other hand, on GT650R you need to concentrate and enjoy.